Red Rock Realty is a pioneer in the Sedona vacation rental concept, providing professional management, maintenance and marketing of privately owned homes in the Sedona area for over 30 years. Contact Red Rock Realty to learn how to make your home a fabulous Sedona vacation destination! Visiting Sedona this Summer? Reserve Dates between June 1st & August 31st, 2019 now. We'll take 10% off Your Rent! 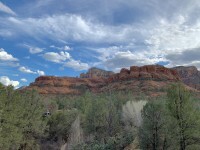 * DISCOUNT ON RENT ONLY * MUST RENT AT LEAST ONE WEEK * CANNOT BE COMBINED WITH OTHER DISCOUNTS (Month rates are already discounted) * ONLY RESERVATIONS MADE AFTER MARCH 20th, 2019 ARE ELIGIBLE * SOME PROPERTIES NOT INCLUDED sedonavacations.com https://redrockrealty.net/sedona-vacation-homes/ Quality Sedona Vacation Homes See you soon!